Updated Bot Store to be published soon! We will be releasing a new Bot Store soon: the improved and redesigned marketplace which supports 3rd-party products now! This means that developers will be able to list and sell their products at SmartBots Bot Store. The new Bot Store is not a replacement for SL Marketplace but convenient, quick and handy place to purchase (or get for free) the tools to work with bots, groups and group advertisement. We are currently testing the new Bot Store. 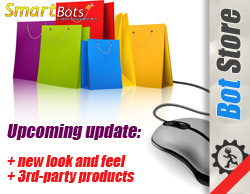 If you are willing to start selling your products here, please contact SmartBots support.